Lately there has been all this talk about Freeganism in the US. Although I haven’t gone all out and started dumpster diving, I have started to look at harvesting fresh fruits and vegetables that are available for free in my surroundings. I have harvested some dandelion greens and wild blackberries from a forest nearby and lately some mulberries from a tree in my neighborhood. So I guess I am not an all-out Freegan but certainly an opportunistic one 🙂 I do believe that a lot of food gets wasted in the US and Freegans are to be commended for their efforts to try to reduce such wastage and also create an awareness about this wastage. This jam is my tribute to the Freegan movement. The mulberry tree in my neighborhood that I prefer to pick from (because it is easy to reach the low branches) is close to a walking/biking path. Oddly enough, while I was harvesting the mulberries several of people stopped by to ask what I was doing performing odd stretching exercises while being attached to tree branches. Most people just didn’t know that mulberries are edible. And then while I was there picking the berries, four elderly ladies hopped out of a car, all equipped with plastic baskets and rubber gloves (mulberries can stain your hands) and so the five us picked the berries together and had a merry time. I suppose, they were from a generation when picking fruit off a tree was considered to be okay. They planned to make pies out of their mulberries and I planned to make a jam and so we exchanged our recipes and phone numbers. I’ll go by their houses this week and deliver my little jars of jam to them. 1. 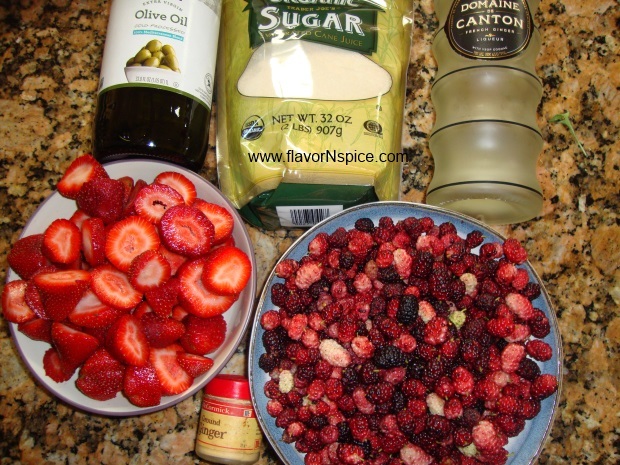 Wash the strawberries and mulberries in a stream of cold water and remove the stems or leaves that maybe attached to them. 2. Dry the fruit with some kitchen paper towels. 3. 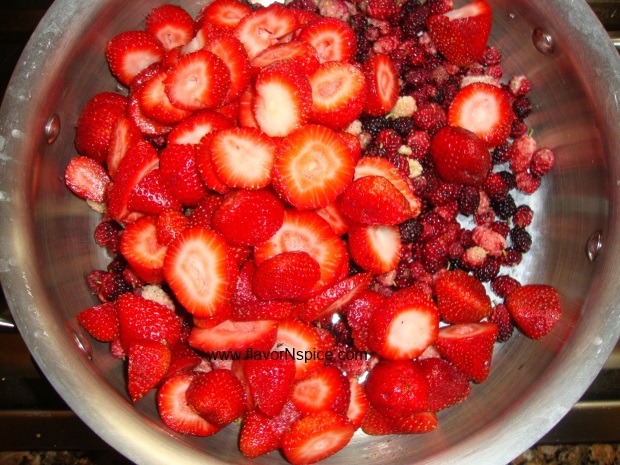 Chop the strawberries in small bite sized pieces. 4. 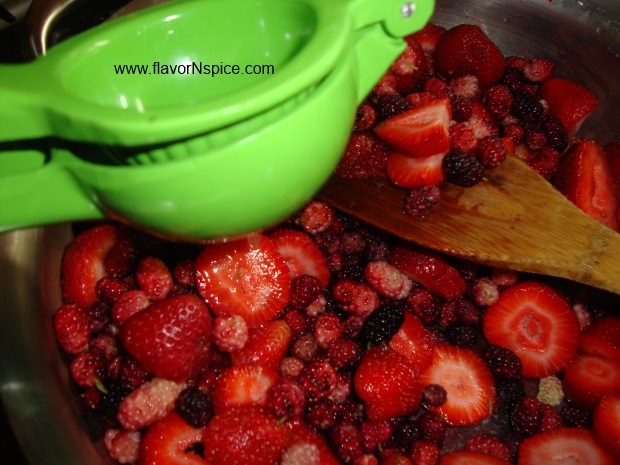 Place the fruit (mulberries and chopped strawberries) in a large heavy bottomed pan and start cooking them on low to medium heat. 5. After cooking the fruit for 5-7 minutes, add the juice of one lemon to the fruit. Stir the fruit after every 2-3 minutes. 6. Add the dry ginger to the fruit and stir. Sorry this image is a bit hazy – its because the steam from the jam clouded my camera! 7. 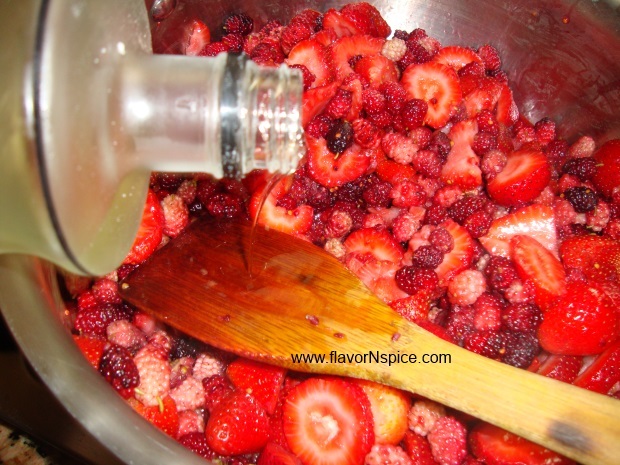 Also add the ginger liqueur and stir (if you do not consume alcohol, you can do without the liqueur entirely – I just use it to add another layer of flavor to the jam). 8. When the fruit looks about half cooked, add the sugar to the pot and stir. 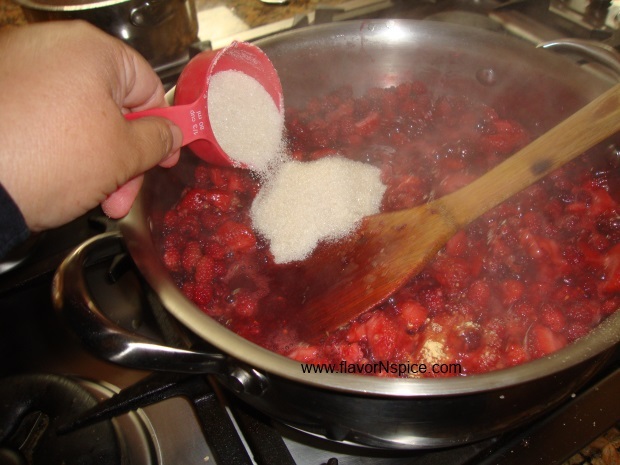 You can also use a wooden spatula to pop the berries and to get them to release their natural juices. 9. 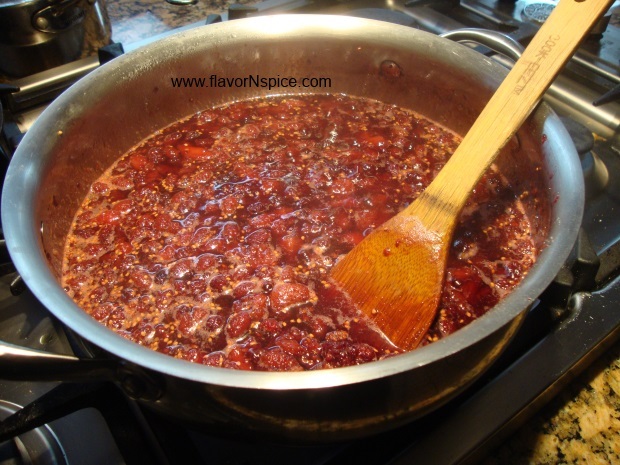 Continue cooking the jam until the fruit looks like it’s getting thickened. 10. 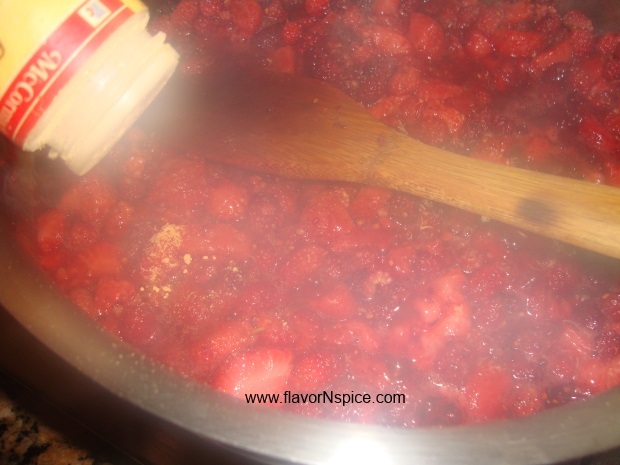 Add the olive oil (it gives the jam a bit of extra smoothness and sheen) and the lemon flavor to the pot and stir. Cook for another 5-7 minutes. 11. Cool the jam down and then fill it up in small canning jars. 12. 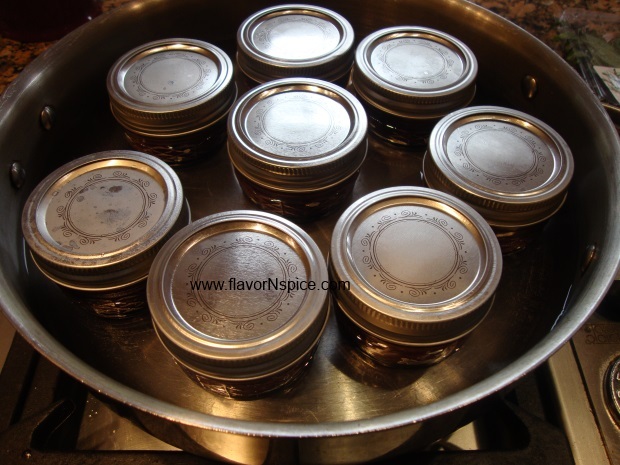 To complete the canning process place the lids on top of the jars and tighten them and then place them in a large pot with a little bit of water in them. Heat the jars until you hear the lids popping to seal the jars. 13. 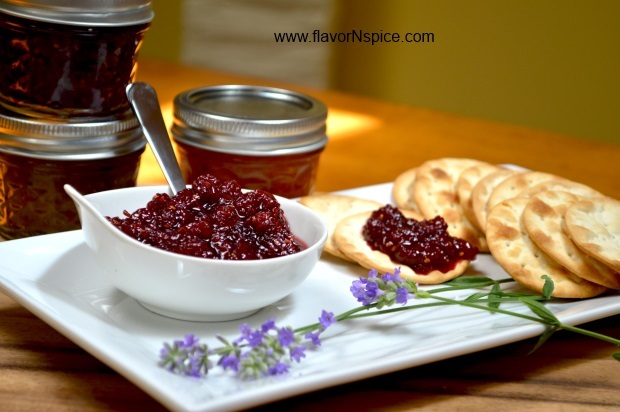 You can eat the jam with a hot buttered toast or crackers and cheese. It’s absolutely delicious – bursting with lemon flavor and a slight crunch from the seeds of the berries. Yum ~ love that you put ginger in the jam. That sounds so delicious! Thanks for sharing the recipe. WAY too funny.. I was in the search for a mulberry jam recipe without pectin, and had a crazy idea to make “Ginger” mulberry jam. “Ginger Mulberry Jam” did not register any hits, but low and behold, I opened your recipe and BAM! There it was! Yeay! And no pectin, to boot (every time I make it with the normal pectin recipe, it comes out SO thick its almost pastey)! Thanks, heading to the kitchen to try it right now! Hi Brenda! Welcome to FlavorNspice 🙂 wow!!! I am so happy you found me through a simple search on the web. 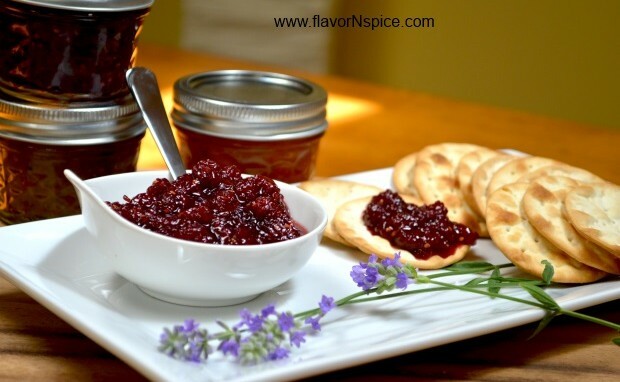 Yes, do try this jam – it’s easy to make and absolutely delicious. 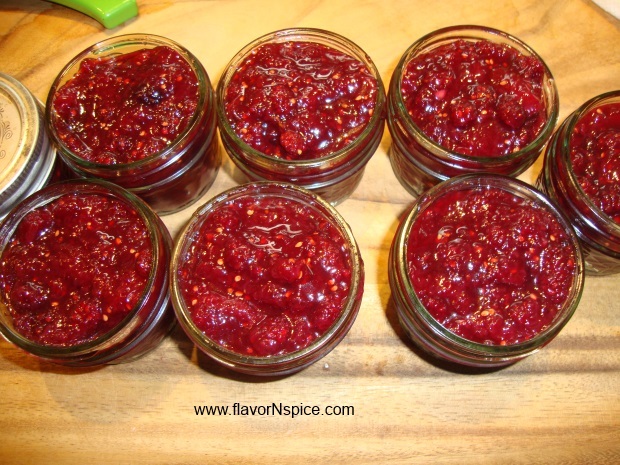 I have quite a few other jams and chutneys on the blog – such as the Spicy Peach Chutney, Kumquat Marmalade, Strawberry Rhubarb Vanilla jam etc… Let me know if you try any of them, I would really appreciate any feedback you might have to offer. Also I am on facebook – the page is called FlavorNspice and if you “like” it you’ll be able to get updates on whatever new recipes I post. 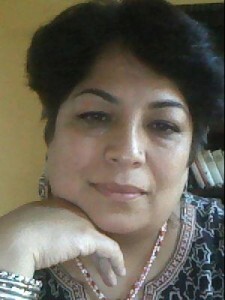 Once again thanks for visiting my page – I hope you’ll find it useful and fun!!!! I, too, found you through a Web search. I have a Mulberry tree going wild this year with Mulberries. I’ve made several Mulberry pies and Jams. I had to find something different and found yours. Just made it tonight and it’s delicious!!!! Yes, a bit of a kick that works so well with the flavor of Mulberries. I have 22 fruit trees (my mini orchard) and will definitely look up your other recipes. I’ve made Pear chutney, but never peach, so I definitely give it a try. Perfect Web site for me as I love canning my fruit..as well as donating it to our local food banks. People need fresh produce that they normally can’t get from commercial sources. It’s all food after all.